Getting locked out your home or office, closing your car boot with your keys inside or getting stuck in a room with a faulty lock is a valid reason to panic. 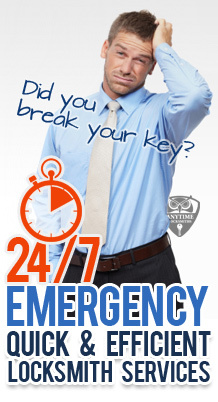 Anytime Locksmiths emergency service is a valid reason to stay calm. Our speedy service means a professional local locksmith will be with you in just 30-40 minutes to pick, fix or replace your lock and let you in or out. And since emergencies are not limited from 9 to 5 our emergency locksmith service is available 24 hours a day 7 days a week. With increased sophistication of locks, the need for an expert locksmith is on the rise. Keyless locks, electronic keys and elaborate security systems which are constantly updated require the correct tools and machinery to be able to open and replace locks and keys. Anytime Locksmiths requires emergency locksmiths to be trained and carry the necessary tools and keys to be able to provide immediate service on site. If your home or property has been burgled you will want your locks changed as well as security advice on how to prevent further break-ins. A security expert can help replace broken or weak locks as well as install additional security features. You are almost twice as likely to be burgled in the first twelve months of moving into a new house. Homes without security measures like deadlocks on doors and window locks are almost 10 times as likely to broken into. Many combination safes such as those found in hotel rooms can be easily opened using default number codes. Most insurance companies require British Standard 3621 locks on entrance and exit doors. If you do not comply you are not covered. Anytime Locksmiths uphold top standards in locksmithing and guarantee customer satisfaction. Using the most up to date locksmith tools and equipment ensures non destructive entry or damage wherever possible leaving customers both safe and happy.